Ananna of the Tanarau abandons ship when her parents try to marry her off to another pirate clan. But that only prompts the scorned clan to send an assassin after her. When Ananna faces him down one night, armed with magic she doesn’t really know how to use, she accidentally activates a curse binding them together. 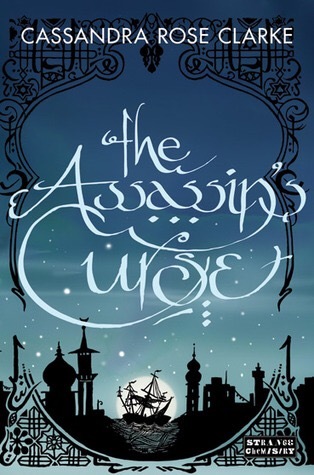 To break the spell, Ananna and the assassin must complete three impossible tasks–all while grappling with evil wizards, floating islands, haughty manticores, runaway nobility, strange magic…and the growing romantic tension between them. Ananna is a pirate, born and raised on the sea with a pirates personality through and through. Her sword fighting, stealing and snarky attitude help her achieve her dreams. She wants to travel to distant lands on her own ship with her own crew but her family wants to marry her off as she is but a woman, therefore not entitled to her own ship. She takes the plunge and runs away from one situation into another one. Assasins, witches akd curses loom over her. The plot of this book was amazing and, Ananna was an awesome protagonist. She was badass and stubborn but not in the least bit annoying. Naji’s is the assasin sent after her but due to the curse his destiny changes.All covered in blood magic, scars and tattoos, he is your typical bad boy.Enemies become allies, if only to survive and eventually go there seperate ways. I loved the change from them being enemies, to frenemies and then almost friends. Their is no ridiculous inst- love or anything of the sort. I was able to relate to the characters because they weren’t perfect, and despite the magic within the novel, it was fairly realistic… The relationship between the characters. Great book, I cant wait to read the next one!